For those of you who are Bake-Off addicts you may remember that the contestant had to make a Sachertorte as one of the no-recipe challenges. This torte is a Viennese speciality (apparently Dec 5th is National Sachertorte Day!). I've been wanted to make one of these ever since. I bake quite a lot but always the same things....mostly victoria sponges that I whip up in 10 mins off the top of my head. This looked way more involved and a bit of a challenge but achievable nonetheless. 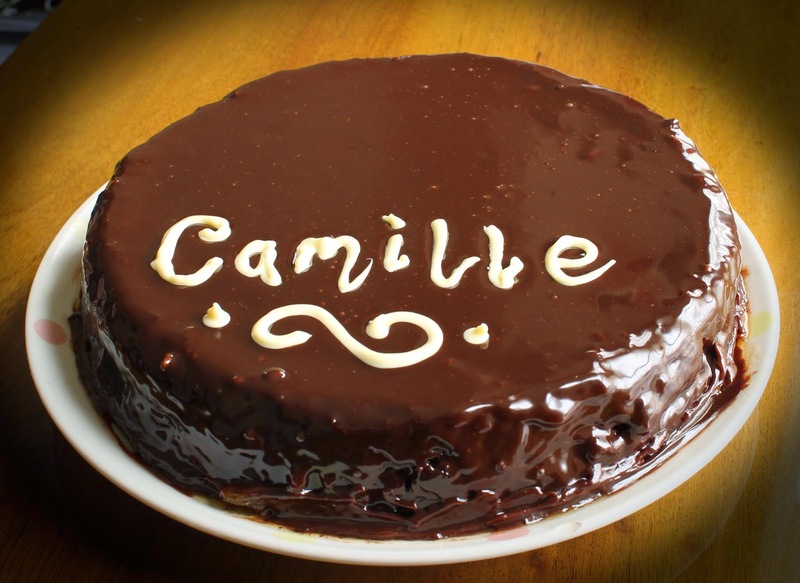 We were celebrating our friend Camille's birthday Friday so took it as the perfect opportunity to give the cake a go. The recipe I used was in the book '100 Cakes and Bakes' by Mary Berry. It is a funny old recipe.....no fat, no flour. Instead it uses ground almonds and the amazing power of eggs to retain air when whisked (I still marvel at this!). It also uses a lot of dark chocolate! The oh so shiny icing is a mix of dark chocolate and double cream and the piping is done using melted white chocolate. How did it taste you may ask? Not wanting to blow my own trumpet too much IT WAS ABSOLUTELY BLOOMIN' DELICIOUS!! !